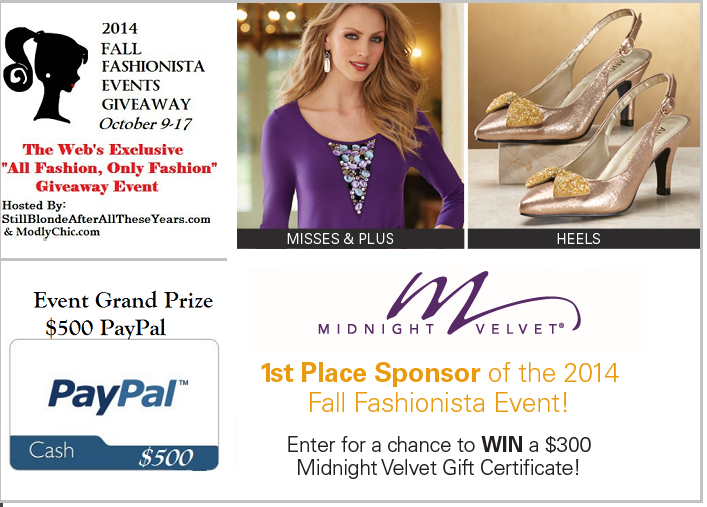 The Fall 2014 Fashionista Giveaway Event is Here! Good morning darlings! How about an epic giveaway to make up for my lack of posts lately?! How does $201 in fabulous prizes sound?! Sounds good right? Well it's about to get even better get those mice ready to start clicking! Nski Beauty has joined in the on the fun that is the 2014 Fall Fashionista Event! There are over 100 giveaways to enter in! We've partnered with It's A Bling Thing for $126 in amazing accessories including: four statement necklaces, blinged headband, infinity scarf and beaded winter head scarf + a $75.00 etsy gift card to Shameless Statements etsy store to turn the flare up even more with some seriously fabulous custom made jewelry! Thank you for entering Nski Beauty's giveaway but don't forget to try your hand at the grand prize and all the other amazing giveaways going on! Check it out! NOW HOW ABOUT THE GRAND PRIZE?! I love all the It's A Bling Thing pieces, so I'd LOVE a giftcard to spend there! Most excited about the etsy giftcard! I'm excited about both but I would love the Etsy giftcard! I'm excited about the jewelry! I would love to have the jewelry the most. I'm excited about the Bling Bling jewelry! The Shameless statements g.c. would be fun to have! hi, the $75 gc to 'shameless statements' jewelry would be a super win for both of us! I'm excited about the Bling Thling jewelry! I would love the Shameless Statements gift card, I'd get something for myself and for my sister for Christmas! ENTERED UNDER ALONA Y. My favorite is definitely the scarf. I am most excited about Shameless Statements. Beautiful stuff! I'm excited about the shameless statements! I am super excited about the Bling -- my nieces and daughter would go crazy for this jewelry! They are both fabulous prizes and my daughter and I would have a blast going on a shopping spree together! Both are good, but I'm a sucker for jewelry. very excited about the bling thing, love oversized loud jewelry and I dont usually go buy it for myself so this would be great! thanks. I'm most excited about the statement necklaces. They are super cute. I think Its A Bling Thing would excite me most. I'm most excited about the gift card. I love to pick out my own! The jewelry would be so fun! That blingy headband is so adorable! I need it!! Im most excited about its a bling thing! I am most excited about the shameless statements gift card! I am most excited about the etsy gift card! I'm excited about the gift card because I'm loving the Sparkling Metallic Beaded Boho Chic Statement Necklace on Antique Silver & Bronze Leather on the Etsy site. I'm excited about both, but even more about the Shameless Statements gift card. I'm most excited about the etsy gift card. the statement necklaces are my fav! I am excited about the jewerly. It is hard to choose a favorite between the two, but if I had to I think I would pick the It's A Bling Thing prize package. Both are awesome would love any. I am a costume jewelry nut! I just love it! So it stands to reason that the Jewelry is what I am most excited over. Great items, I love bling! Esp. hair pieces! That is a tough choice. It's a Bling Thing barely edges Shameless Statements out. It's incredibly close. I'm excited about the Shameless Statements gift card. I love unique, handmade jewelry! I am excited about the blinded headband. Both prizes are fabulous, but I am most excited about the gift pack to It's a Bling Thing. Loving the selection at It's a Bling Thing! I am most excited about the jewelry..from both places! Jewelry is one thing that I never spend money on, I really could use a jewelry makeover! I'm most excited about the gift card to Shameless Statements. They have wonderful pieces that I'd love to own! Its a bling thing!!! I love Jewlery. I love the jewelry. I need to update my look! It's a wonderful giveaway, I wish this was open to international participants too! It's a Bling Thing jewelry! Who couldn't use more jewelry!? Love their style! The Shameless Statements etsy Gift Card. (Rafflecopter name is Kimberly). I am most excited about the ShamelessStatements giftcard because I took a peek at their website and I am now officially in love with the Antique Brass Steampunk Heart Wings Pendant Necklace! I love Shameless Statements on Esty, so many great pieces, and then I see the Pieces that Bling Thing is serving up and wow. I can accessorize everything! It's a bling thing has a lot of stuff my girlfriend would love. the beaded winter headscarf!!! Its so pretty! I am most excited about the It's A Bling Thing Jewelry! I am most excited for the jewelry! I don't own much jewelry but want to, so I am excited about that! I would love to win the gift card! I don't get a chance to wear jewelry other then what I made so the chance is exciting! i want the bling thing jewelry. I'm most excited about the It's A Bling Thing! I'm most excited about the It's A Bling Thing prize. I really like the shameless stuff, then I see the other items and get all excited..
"Its a bling thing Jewelry" Love all the jewelry, its all so pretty!! The It's A Bling Thing Jewelry Credit!! I am most excited about the It's A Bling Thing Jewelry. I'm super excited about the gift card to Shameless Statements, I would love to get the Sparkling Metallic Beaded Boho Chic Statement Necklace and the Antique Gold Beaded Pink Threads Boho Chic Statement Necklace. I love both places, but the Bling thing is catching my eye today. It's a bling thing! Beautiful pieces! I would like the Etsy gift card most. I'd be most excited about the It's A Bling Thing, because they have some seriously cute stuff! 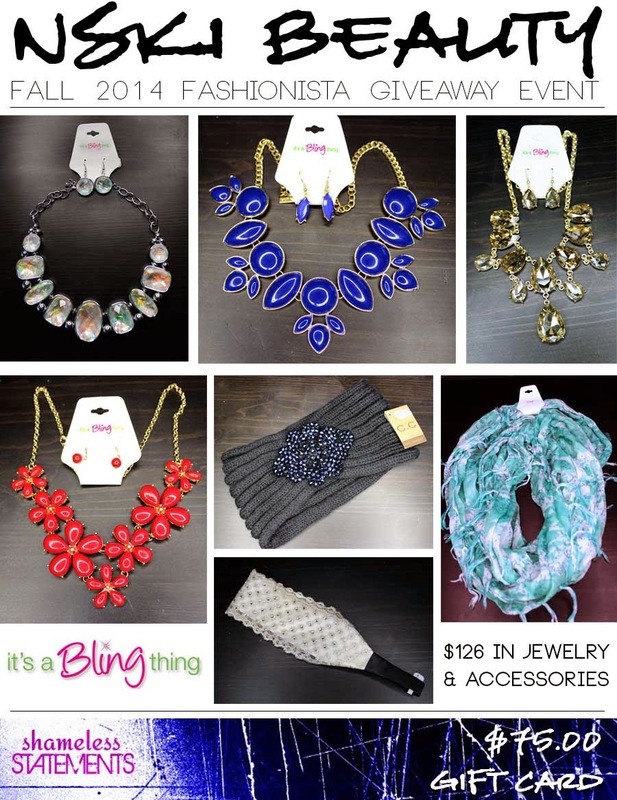 I am so excited about the accessories being given away by It's A Bling Thing. So awesome! I love the statement necklaces from It's a bling thing! I'm excited about It's A Bling Thing statement necklaces. I am excited about the jewelry! As a jewellery junkie, it is the statement necklaces! I'm excited for the It's a Bling Thing gift card! The blue necklace would be a huge hit with my daughter. I would love to give her that. She tries to do so much for me, it's always nice when I can give back. I'm excited about both but if I have to choose one I choose the gift card. Thank you! I am excited about the jewelry....and gift card :) !!! I'm excited for the scarves! I love that red necklace! I am most excited about the etsy shop! It's a Bling Thing jewelry. I am most excited about jewelry. I love jewelry. probably the necklaces and the scarf! I am most excited about the It's a bling thing prize. Thank you so much. I am excited about the Bling Thing jewelry/accessories! The jewelry AND also the etsy gift card! I am so excited for the It's A Bling Thing jewelry! I'm really excited for It's a Bling thing jewelry! The etsy gift card sounds really good but so does the other gift card. I'm most excited about the jewelry they are all such great pieces! I love all the jewelry I will look good no matter what I wear. I love Jewelry, so I'm really excited for the Bling thing. I love their statement necklaces. The etsy gift card or the beaded headband. The Shameless Statements Gift Card!! I am excited for the scarf.. And winter! I'm really excited about the gift card, I can get some Christmas gifts! I love it all but I think the gift card would be my favorite as I could let my daughters pick out something they like. I'm excited for It's a Bling thing jewelry, but the gift card would be a lot of fun too! I think both gift cards sound great and I would be happy to win either one! the jewelry is good looking stuff! Its a bling thing jewelry sounds great! I'd say It's a Bling Thing - but they're both great prizes! I am most excited about the It's A Bling Thing Jewelry GC. I like the jewelery especially the necklace. I"m excited about the It's A Bling Think Jewelry! The bling thing GC! Sweet! I would like the giftcard. I love custom jewelry. I am excited about the Blinged Headband. I'm really excited about the It's A Bling Thing Jewelry prize! I am most excited about the Shameless Statements gift card. I'd be so happy to win either! First prize because I love statement jewelry and second prize because I also love personalized pieces! I love the headband, but would love to check out It's A Bling Thing in person sometime too! Cute stuff!! I'd like the Beaded Head Scarf...I don't like hats....but this looks like it'd be great to keep my ears warm on these cold WNY Winters. Thanks and God bless! Ahh both, but I think the It's a bling thing! It's a Bling Thing! However, I love the other one too. Tough choice. I am excited about the Shameless Statement shopping spree. I like both, the jewelry because it's gorgeous and the gift card because I can choose what I like best. Thanks for the chance to win! I'm really excited about the gift card since I could pick some things to match my own personal style. Excited about the Bling Thing prize. Thanks for a great giveaway! I love Etsy - I would choose the Etsy card!